A long time ago, in a theater not that far away... my life was forever changed. Back before sports cards became my favorite way to kill time... my parents took me to see Star Wars. And since that day... it's been one of my favorite film series. My obsession with Star Warsaction figures, video games, and comic books have long subsided... but I'll still watch the original trilogy at least once or twice a year. I even think about going back and purchasing the original Topps sets, since they were the first trading cards I ever collected. These days, I prefer collecting baseball, football, and hockey players over Jedis, Wookies, and Sith Lords. But every now and then, I'll purchase a piece of Star Wars nostalgia to keep me in touch with my childhood. These cards are similar to the baseball "ring" cards produced by Topps these past few years. 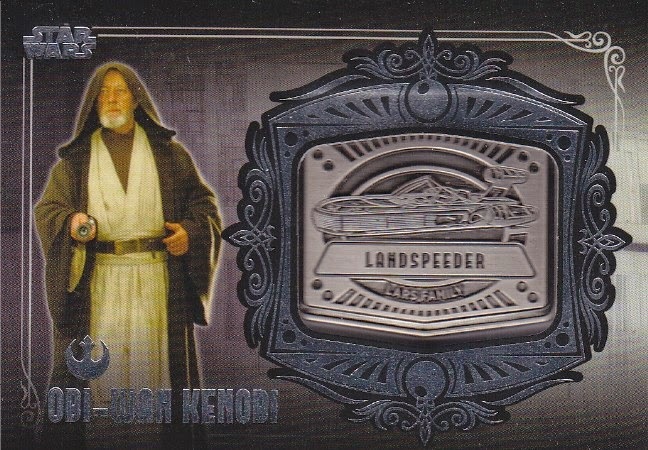 I originally wanted to purchase Boba Fett's Slave Onemedallion, but this card turned out to be much more affordable. You can expect to pay close to thirty dollars for a Fett, while these cards are routinely sold in the $8 to $10 range. And after going back and forth on whether or not to pick this up... I remembered how Kenobi sacrificed himself so that Luke, Han, Leia, and the droids could escape the Death Star. It's one of the coolest, selfless acts in the history of Sci-Ficinema. Happy Star Wars Day! And May the fourth be with you. Great card, from a Great Franchise - I cannot wait for the new movie in 2016! Thanks! I wish I had the Slave I, Boba Fett card.